Cerebral edema is associated with common brain tumors. Aquaporine-4 (AQP4) is a member of the water channel protein family, which is thought to be a major factor regulating cerebral edema. To elucidate the characterization of the expression of AQP4 and the relationship of the expression of VEGF, we investigated the expression of AQP4 in tumors of the central nervous system immunohistochemically. 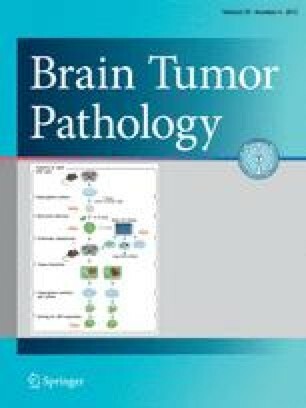 Brain tumors and nontumorous cerebral tissue for control were evaluated by immunohistochemical staining using anti-AQP4, VEGF, CD34, and MIB-1. In tumor cells, only glial tumor cells showed a positive reaction for AQP4. The reactivities for immunostaining increased according to WHO grades. Reactive glial cells in edematous tissue also showed positive reactions. Although endothelial cells were negative and/or weakly positive for AQP4, the positive relationship suggested the expression of VEGF in endothelial cells in neovasculature and that of AQP 4 in tumor cells. APQ4 expression increased in human astrocytic tumors and edematous cerebral tissue. Upregulation of APQ4 by tumor cells and reactive astroglia were major factors of cerebral edema.